By now you have heard the saying that it takes an average of 21 days to form a new habit. This means that if you are bound and determined to give up soda, the first few weeks might be pretty challenging as you sip water and iced tea instead of Dr. Pepper and his associates. But after that, the pop-free habit will be fairly ingrained and therefore will be easier to stick to. Now, you might be considering which healthy habits are worth pursuing, as well as ways to go about achieving your goals. With this in mind, here's how to form healthy habits in less than 30 days. Most habits tend to rely on the three Rs reminder, routine and reward. A simple example of this phenomenon is when the doorbell rings. The ringing bell is the reminder that inspires you to get up and answer the door. Opening the door is the routine or behavior, and the reward is finding out who is standing there—hopefully a Girl Scout with cookies instead of a door-to-door vacuum guy. With this technique in mind, if you can figure out ways to remind yourself to do whatever healthy habits you choose to implement and a subsequent reward, the new habit is more likely to be repeated. Work on one habit at the time and go all the way to the 21 days before choosing another one. If your mornings involve grabbing a sugary granola bar or muffin on the way out the door to work, it might be time to give your breakfasts a healthy makeover. The notion that breakfast is the most important meal of the day is more than a common expression—it’s really true. 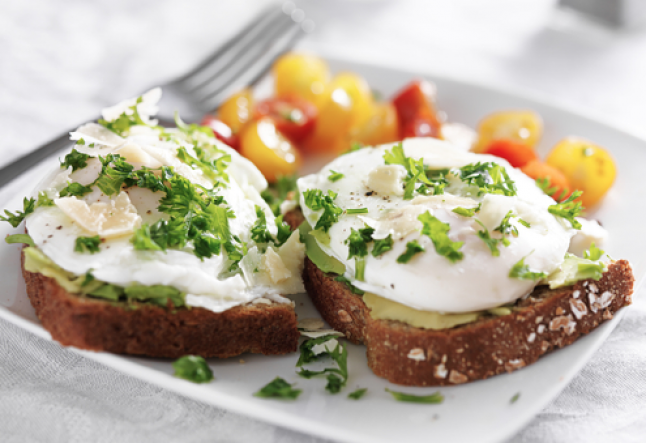 In order to make it a habit, find a way to remind yourself to eat better in the morning; this can be something like setting out healthy ingredients (like an avocado and bag of whole grain bread to fix a scrambled egg and avocado over wheat toast) or even setting your alarm 15 minutes earlier so you have time to make something healthy. Although feeling better and more alert is its own reward, you also can treat yourself to a low calorie organic coffee drink after eating a good breakfast every day for a week. With all of your other responsibilities, it can be difficult to find time to take proper care of your eyes. So, start with something simple like wearing sunglasses with UV protection when you go outside. To remind yourself, leave them by your car keys, and then reward yourself with a nice new pair of shades once you've made the habit. Or, if you wear contacts, make it a habit to properly clean them every night. Your improved vision will serve as its own reward, but you also might want to reward yourself with some new clothes or something fun to do. You’ve probably heard it from your dentist a million times—you need to floss your teeth every day. To help encourage regular flossing, set a certain time of day or certain meal to floss after. Then, buy a few packages of floss and keep them in your bathroom, by your bed or wherever they will help to jog your memory. To reward your efforts, purchase a snazzy new toothbrush with sonic technology or some other small item you’ve had your eye on. Got the concept? Now go ahead and set your new habits!